Here’s a modern version of Vegan Apple Pie, with no refined sugar and a no-bake crust. How amazing does that sound? 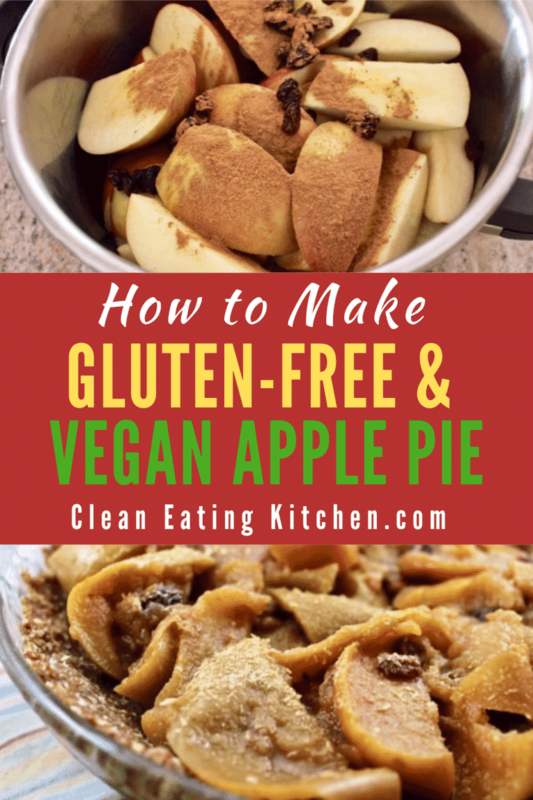 This delicious apple pie inspired me to make this version, but I adapted it to have less sugar than traditional recipes, plus I made it oil-free with a no-bake crust. I realize it’s not exactly apple season, but I’m still finding remnants at the farmers’ market and other stores. 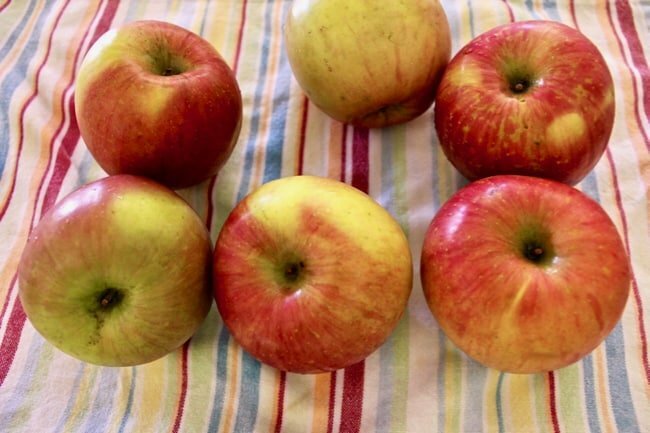 I always prefer Fuji apples for baking since they’re so naturally sweet. Truth be told, I attempted to pressure-cook this concoction, but I was unable to get the pot up to pressure. So, I ended up just cooking the whole thing on the stove-top until the apples had softened, about 15-20 minutes. At the very end of the cooking, I added a special ingredient that is part of the modern twist to this recipe…nutritional yeast!!! 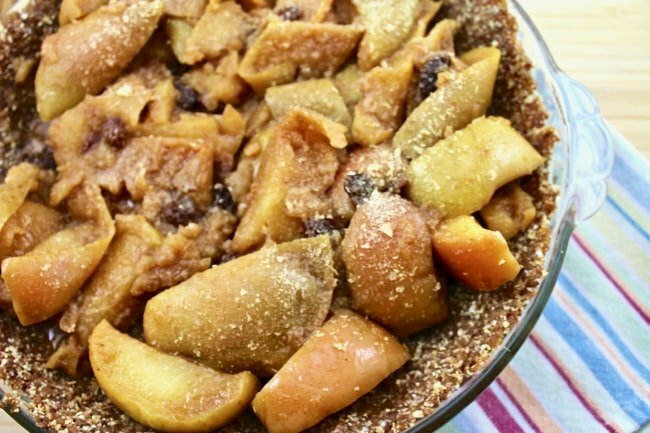 Anywho, I highly recommend adding the nutritional yeast, it added a wonderful, subtle flavor to the filling that was even reminiscent of apples and cheese, but not overly so. I set that aside that aside while I made my crust. I ended up a making a slight variation of the raw, nut-based crust from my Marionberry Ice Cream Pie recipe; this one uses a combination of almonds and walnuts, with the addition of cinnamon. The pie crust is so simple, you just process the ingredients and press them into a pie dish. Then, to pull together the pie, you just pour the filling into the crust, there is no baking required. 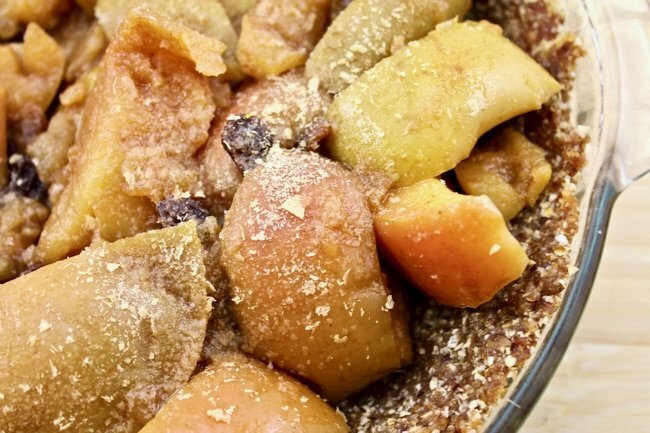 Here’s a modern version of Apple Pie made vegan, with no refined sugar and a no-bake crust. Core the apples and cut them into bite-sized pieces. 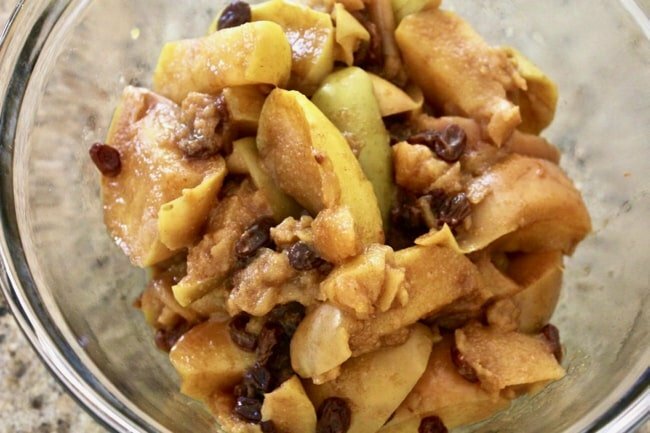 Combine the apples, orange juice, raisins, 1 teaspoon of the cinnamon and ½ teaspoon of the vanilla extract into a saucepan. 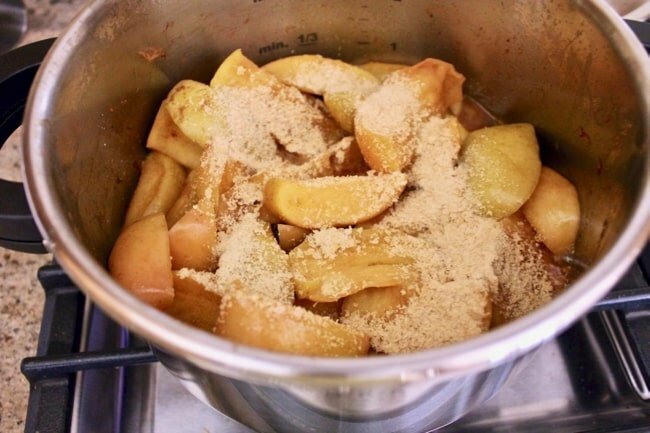 Bring mixture to a boil, reduce heat, and simmer uncovered for 15-20 minutes, or until apples are softened. Stir in nutritional yeast and set aside to cool. 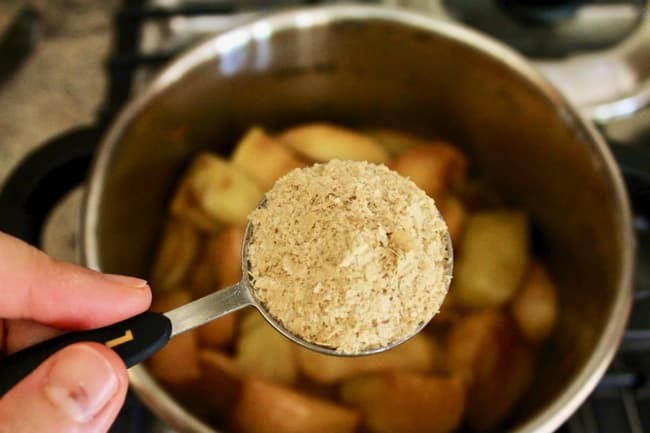 Place almonds, walnuts, and oats in a food processor and process until finely ground. Add the remaining cinnamon and vanilla extract. Turn the food processor on and add the dates through the feeding tube one at a time. Process until mixture is well combined. Pour the contents of the food processor into the pie dish and use your hands to spread evenly into the dish. Place the crust in the refrigerator to chill for at least an hour. 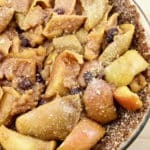 When you are ready to assemble the pie, pour the apple mixture into the pie crust and serve cold or at room temperature. I do recommend chilling the entire assembled pie for about an hour before serving, just to help everything come together, but you could definitely serve it with the filling still warm. In that case, it would likely be more of a crumble than a pie, but delicious nonetheless. 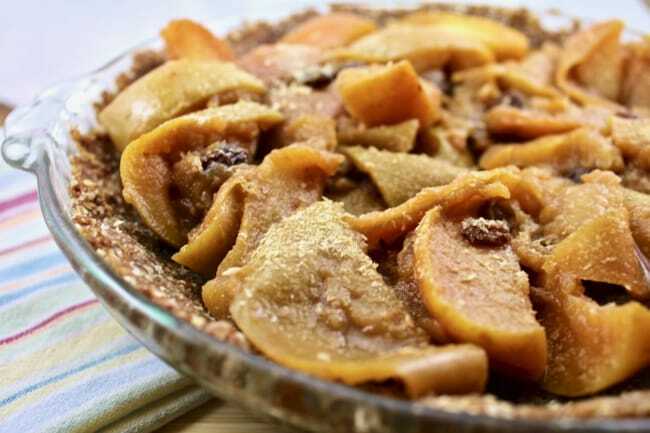 Pin this Vegan Apple Pie with a No-Bake Crust to your favorite healthy Pinterest board! 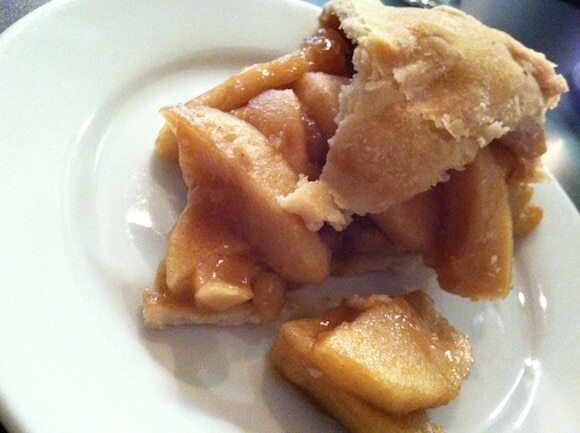 I love the title of this dessert – modern apple pie. I had never thought about adding nooch to dessert recipes! Glad you are feeling better and starting to get back in the swing of things. I will have to check out the Blossoming Lotus when I’m in Portland in a few weeks! 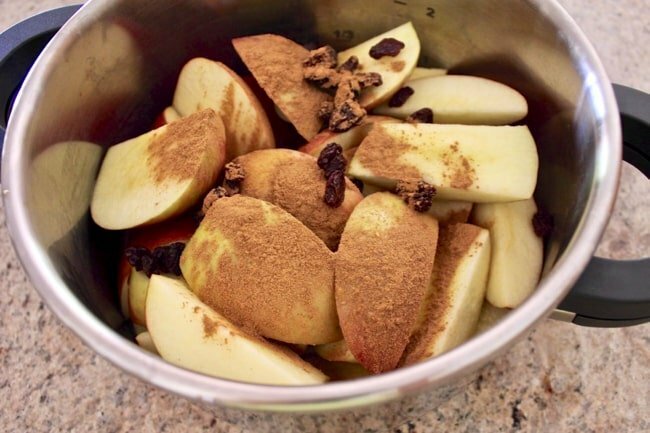 My fiance absolutely loves apple pie, he would just die if I made it – I have never attempted it. 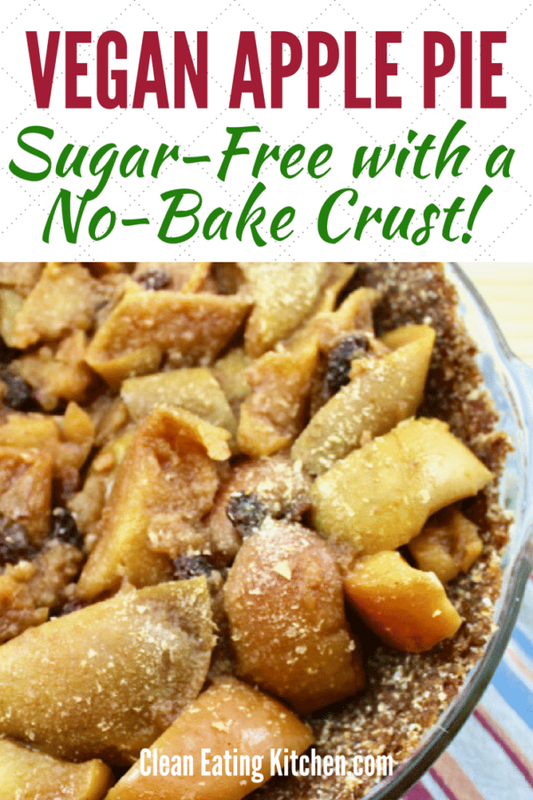 Baking usually intimidates me but this looks pretty easy and definitely DELISH! I love raw apple pie. It is so funny, I thought I was weird adding nutritional yeast to my green smoothies! Well, maybe I am weird but at least I’m not alone! Nooch is good with sweet stuff. So jealous you were at Vida Viva Con! I’m off to read your recaps now. LOVE Blossoming Lotus — I missed going on this trip to PDX, but next time for sure! This pie looks great! I’ve been trying to think of a new recipe to try out with the tail ends of rhubarb we have in the garden — maybe a variation on your apple pie! Thanks! This looks so good. Wish I had some now for breakfast! I have sleep issues also and have been on thyroid meds for many years. Had Graves Disease and have 90% of my thyroid removed years ago. I thank God for levthoyroxine! Nooch was going to be my second guess as to what the mystery ingredient was! I know people eat cheddar cheese slices with apple pie, so it seemed logical lol. I am buying the ingedients tomorrow(including a pie tin) to make this. Carrie, what’s your favorite crust so far? I want to make a version of the raw strawberry tart, but would prefer a crust that involved fewer ingredients and no cooking (date paste). The apple pie looks delicious, too. Hi Sarah, I definitely like the nuts combined with the oats for a no-cook crust. Depending on how sweet your filling will be, you can use from 10-15 Medjool dates in the crust. I use a ratio of about 1 1/2 – 2 cups of nuts, 1 cup of g/f oats, and then the dates. That’s really all you need! The crust is pretty thick, but I prefer it that way so it sticks together and because it’s so delicious. An interesting and very easy to prepare recipe. Thanks Carrie for sharing this wonderful recipe!